Summer Swimming Registration is Open! The winter season just ended with a top 15 finish at Midwest Regionals, but SDMS is already gearing up for our next swim programs, the Summer Club season, Spring & Summer Swim Lessons and the Advanced Spring Swim Camp. Read more about the registration options and details below. The summer club season works just like the winter season. The team will go to ability-specific practices and swim at meets on Monday nights. Plus – there is a SDMS Championship swim meet on July 27th where swimmers have the chance to earn medals! Please read the practice schedule below carefully. It’s slightly different than last summer’s season. Novice & Intermediate Swimmers now practice 4 days/week in the summer! Advanced swimmers now practice 5 days/week in the summer! Note: Middle School Elite Swimmers practice chose from the Advanced practice options above for summer season. This group will practice Monday-Friday 5:00-6:00PM beginning Aug. 31. Especially for the winter slots! Note: SDMS works hard to keep practice costs low. 2015 is the first increase in two years. While the increase for the summer season was minimal and came with additional practices, the winter increase will be more significant due to the fact that season is 2.5 times as long. Interested in learning more about how practice fees are used? Read more here. This swim camp is for SDMS Advanced and USA Elite swimmers (who are not in the Invite Only group). It’s a chance for them to swim four days a week to stay in swimming shape for the upcoming competitive season. Spots in the camp are limited as many were filled by year-round swimmers. So be sure to sign up early if you’d like a slot! Just a reminder: If you signed your athlete up for Year-Round Advanced or MS Elite swimming, they ALREADY have a spot in this camp at NO EXTRA COST. You don’t have to re-register them. You will simply confirm attendance to the camp via an email to Coach Weber. South DM Swimming is proud to offer swim programs for all levels of athletes. A key piece to this vision is the SDMS Lessons Program. In 2015, we were able to expand our lessons program to offer a spring lesson and evening summer lessons for the first time! The swim lessons program has in-water instructors and three class levels. 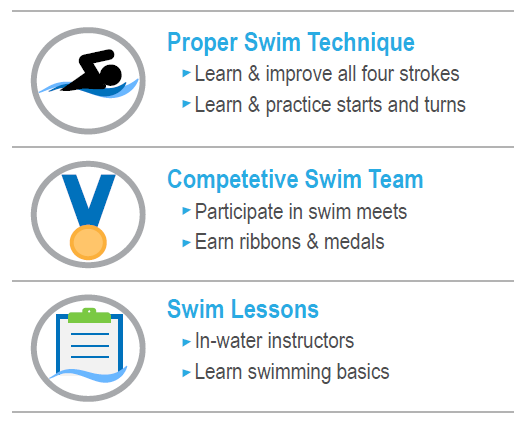 The program is designed to help non-swimmers gain the skills needed to join the SDMS club team at novice practices once all three levels of lessons are complete.